Discussing this precarious issue we study Technical English! People need to be persuaded in safety of NPPs (Nucler Power Plants) in order to be convinced that all plants, worldwide, are safe. Warming of our planet. Finally, governments worried about climate changes and energy security have noticed that nuclear plants emit no carbon dioxide. Moreover, the raw material for their fuel, uranium ore, can be provided by reputable and reliable suppliers. Ricing of oil and gas prices. The recent jump in oil and gas prices, has compeled many governments to reappraise their opinion about nuclear power. In February of this year Italy and Sweden announced plans to start building nuclear plants again. Most of the 40 or so plants now under construction are in Asia (many in China) or Russia. Furthermore, countries in Latin America, the Middle East and Africa are also either building or planning reactors. Turkey, the United Arab Emirates, Indonesia and Belarus are intending to erect their first reactors. Raising to higher level nuclear plants safety. WANO – the World Association of Nuclear Operators has been monitoring safety at nuclear plants for 20 years. IAEA – the International Atomic Energy Agency has developed safety rules, which are voluntary till now. The agency’s experts are invited in to look at nuclear reactors around the world. But governments decide which plants to show, and when.So, last year in November the European Commission proposed making the IAEA’s safety rules obligatory within the European Union. It hopes other regional blocks, such as those of South-East Asia and South America, will follow suit. WANO is considering making their peer review compulsory for each new plant opened by one of its members. Due to increasing NPPs safety the nuclear industry has had a better safety reputation since Chernobyl. The design and monitoring of many reactors has significantly improved. Even though plenty safety incidents have occured, no big accidents resulting in deaths have happened. Yet public fears about the safety of nuclear power could still divert its revival. In many countries, majorities oppose building new reactors. People are afraid nuclear accidents, terrorist attacks, the long-term risks of storing radioactive waste and possible divertion of nuclear fuel being to make weapons. Concern about climate change has softened opposition a little. According to a survey by the European Commission last year, 44% of people in the European Union now broadly support nuclear energy, up from 37% in 2005; and 45% oppose it, down from 55%. In America, about 80% of Americans think that nuclear power will be “an important future source of energy”. A new reactor being built at Olkiluoto in Finland is one of only two under construction in western Europe. The Finnish government gave the local community a large say in choosing the site of a radioactive-waste depository at Olkiluoto. Switzerland and Canada have taken a similarly democratic approach to nuclear power. This is a welcome contrast to the secrecy that characterised much of the nuclear industry’s interaction with the public in the past. In some countries that secrecy comes from the military uses of nuclear fission. The extent to which public opposition can block or reverse the building of new nuclear plants will vary between countries. In any case such plants need “a solid political and social base” in order to survive changes of governments. The simplest way how to get permission for building new reactors is to erect them at existing nuclear sites, e.g. in America, 14 of the 21 applications to start building are for existing sites. Germany faces disputatious energy choices. The fate of its 17 nuclear power plants, which provide almost a quarter of the country’s electricity, is the main point of the discussion. Any renewables are not able to replace electricity generated by these nuclear plants. Developing-country governments are less likely to care whether the public support of nuclear power. China has 11 nuclear-power reactors already and plans another 20. Companies from the rich world – such as France’s Areva and America’s GE – will find it far easier to build nuclear power plants in the developing countries than at home. Nonetheless, steps must be taken to ensure that less-developed nations run their reactors safely. Last year France created an agency to help newcomers design nuclear laws and set up independent regulators. Unfortunately, there is an irresistible shortage of qualified nuclear engineers, after the three-decade pause in building new plants (see also Are you afraid of nuclear energy?). 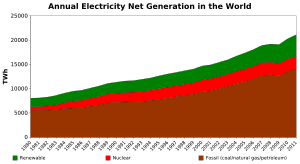 Actual information about Nuclear Power Plants has just been published on Statistics on nuclear power. Enjoy reading it. 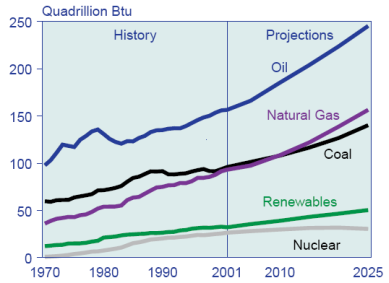 Renewable sources of energy are a hot problem till now. Many specialists, politicians and common peoples discuss advantages and drawbacks of alternative sources of energy. Especially solar, wind and water energy attract debatersˇ attention. Since 2004 several international organizations dealing with renewables have been established. The Political Declaration of the International Conference for Renewable Energies in Bonn, Germany in 2004 – initiated the establishment of a global policy network. One year later, in June 2005, the Renewable Energy Policy Network for the 21st Century (REN21) was officially launched in Copenhagen, Denmark. The strategy of the Network is directed by the Steering Committee of REN21 comprising eminent and prestigious specialists. The Steering Committee members work for various governments, private sector, and civil organisations over all the world. The Secretariat of REN21 is located in Paris, France, and is supported by the IEA. REN21 strives to encourage the ideas and actions aimed at advance of renewable energy exploitation. Linking participants from the energy, development, and environment communities, REN21 sustains their successes and activities for the rapid expansion of renewable energy worldwide. 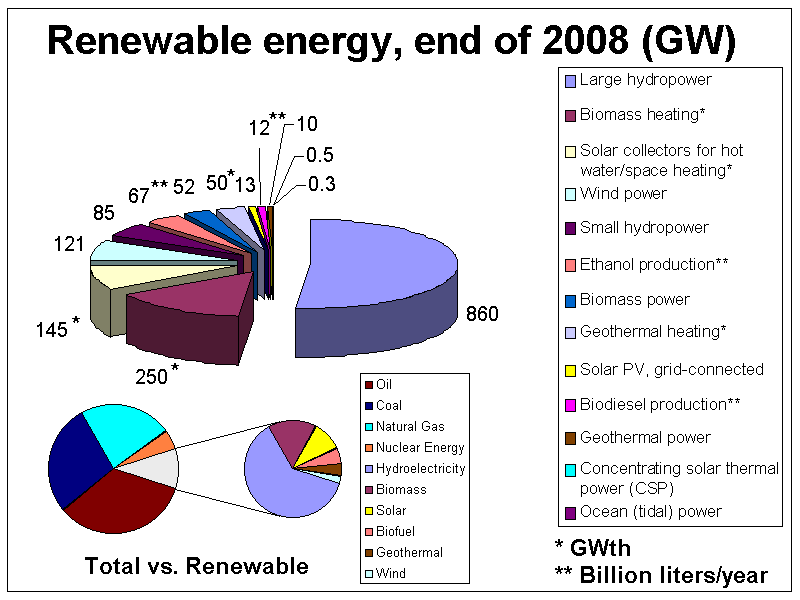 In 2009 REN21 updated the Renewables 2007 Global Status Report, published in March 2008. The updated Report covers the most important changes in renewables worldwide between late 2007 and early 2009. The original 2007 report is available at http://www.ren21.net. What about you dear colleagues? Does the problem concern you? Opravdu „zelená“ energie nic nestojí? Действительно “зеленая“ энергия ничего не стоит? Lidi zřejmě mají zájem o ”zelenou“ energii a měli by mít možnosti jí zvolit i za cenu toho, že budou platit dvakrát tolik. Nejlepší způsob, jak ukázat zeleným, co stojí zelená energie, nechat je platit náklady za provoz zelených zdrojů. Некоторые потребители очевидно предпочитают “зеленую“ энергию, и им следовало бы дать возможность потреблять ее и за цену того, что будут платить в 2 раза больше. Наилучший способ показать “зеленым“, сколько стоит “зеленая“ энергия – это обязать их оплачивать расходы на эксплуатацию “зеленых“ ресурсов. V současné době se již začínají používat technologie měření spotřeby od jednotlivých zdrojů energie. Nové měřící elektronické přístroje AMI (Advanced Metering Infrastructure) mohou být instalovány všude u každého uživatele podle jeho přání. Tyto přístroje komunikují v obou směrech a poskytují dálkové měření množství energie spotřebované od různých zdrojů, zaznamenávají časové pořadí využití energie, vyúčtování za energii a dálkové připojení a odpojení zvoleného zdroje energie. EMS (Energy Management System) databázový software může být uspořádán mnoha různými způsoby odpovídajícími konkrétní situaci. В настоящее время начинают использовать технологию измерений потребления от отдельных источников энергии. Новые измерительные приборы AMI (Advanced Metering Infrastructure) могут быть установлены везде, у каждого потребителя. Эти приборы работают в обоих направлениях и проводят дистанционные измерения количества электроэнергии, потребляемoй от отдельных источников энергии, регистрируют последовательность использования энергии, платежные операции, а также включают и выключают выбранный источник энергии. EMS (Energy Management System) софтвер базы данных может иметь самую различную конфигурацию, отвечающую конкретной ситуации. Díky této technologie spotřebitel si může zvolit mezi konvenčním a obnovitelným zdrojem energie (solární nebo větrný). Pro Spojené království, například, to bude na 99% vítr. Náklady na využití elektrické energie jsou přímo závislé na zdroji. Skutečný cenový rozdíl bude v rozmezí 3 – 5krát vyšší v závislosti na místě bydlení spotřebitele. Takže eko-spotřebitel bude platit skutečnou cenu za eko-energii a rychle si uvědomí iluzornost představy, že eko-energie nestojí “nic”. Благодаря данной технологии потребитель может выбрать классические или возобновляемые источники энергии (солнечную или ветряную). Например, в Великобритании это будет на 99% ветряная энергия. Расходы за использование электроэнергии напрямую зависят от типа источника. Реальная разница в цене будет лежать в интервале в 3 – 5 раз больше в зависимости от места пребывания потребителя. В результате эко-потребитель будет платить реальную цену за эко-энергию и очень быстро поймет иллюзорность мнения, что эко-энергия ничего не стоит. Navíc uživatel, který si zvolí obnovitelnou energii, bude odpojován od celostátní elektrosítě pokaždé, kdy obnovitelný zdroj je mimo provoz. Ve Spojeném Království to může být 1 až 20krát denně zcela náhodně. Tyto akce lze snadno uskutečnit propojením EMS software a SCADA (Supervisory Control and Data Acquisition) software, který se v současné době běžně používá v elektrosíti (měří se obvykle každých 10 vteřin). Tímto způsobem “zelení” poznají na vlastní kůži přednosti obnovitelných zdrojů. Budou platit skutečnou cenu a navíc budou neustale přepínáni. Samozřejmě I tyto spotřebitelé mají možnost se přepnout na spolehlivý klasický zdroj energii, tj. vrátit se k napájení od celostátní síti. Таким образом ’’зеленые’’ убедятся на собственном опыте в достоинствах возобновляемых источников энергии. Будут платить настоящую цену и кроме того будут отключаться и включаться все время. Конечно же и эти потребители будут иметь возможность подключиться снова к надежному, классическому источнику электроэнергии, т.е. вернуться к снабжению от объединенной сети. Bez pohyby, že jakmile v UK se podpoří iniciativa instalovat celostátní měřící síť s cílem snížení poptávky na energii, za několik let veškeré ceny obnovitelných zdrojů budou uvedeny do souladu s realitou. Вне сомнения, как только начнут в Великобритании поддерживать создание общегосударственной измерительной сети с целью снижения спроса, все цены электроэнергии от возобновляемых источников придут в соответствие с реальностью. Autor tohoto komentáře sám žiji ve sluneční Floridě. Ale i tam širší využití solární energie bude znamenat přibližně 3krátní zvýšení účtů za elektřinu. I na Floridě se usiluje o výstavbu 4 nových atomových reaktorů, ale někteří tamější obyvatelé jsou proti tomu. Автор данного комментария живет в солнечной Флориде. И там внедрение широкого использования солнечной энергии приведет примерно к трехкратному повышению цен на электроэнергию. И на Флориде идет борьба за строительство 4 новых атомных реакторов, но не все с этим согласны. 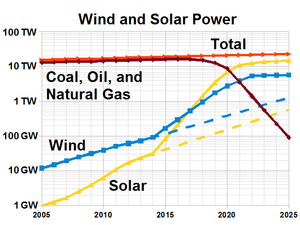 I have recently read a very interesting article about the future of energy sources (Renewable energy – our downfall? By Ralph Ellis). The author of the article, in the compliance with many other specialists, claims that conventional sources of energy (coal, gas, oil) will be exhausted in 30 years. Renewable sources of energy won´t be able replace the amount of electrical energy generated by power plants using conventional sources of energy. Here are some excerpts that summarise the main ideas of the article, with which I completely agree. The governments, under pressure from environmentalists and greens, have agreed to press ahead with usage of renewable energy sources, including wind, tidal and wave power. Nevertheless, despite the vast sums of public money that will be allocated to these projects very little of open debate has been held on the subject. Nobody has even demonstrated the fundamental issue of whether any of these energy generation systems actually work. Any renewable energy resource is ‘free’. In the contrary the conversion from ‘free’ renewable energy to usable grid electricity is eminently expensive. Our civilisation can´t exist without electricity. Six blackouts in 2003 through the whole world showed that. Especially impact of the blackout on 14th August 2003 in the USA was terrible. Within one hour 256 power plants in American North-East fell out. The all North-East lived under emergency conditions, which caused great chaos. All transport (aircraft, trains, road traffic) came out of regular functioning. Water supplies, telecommunications were seriously damaged. Chaos looms, people die, production ceases, life is put on hold. And this was just a once-in-a-decade event. But if this occurs every week and lasts for a longer period, the situation becomes unmanageable. According to recent EU Directives 40% of electricity should be powered from renewable resources by 2020. This energy will be likely mostly produced by winds turbines, which demands to install about 30 gigawatts (GW) of wind generating capacity. Now the UK has about 0.5 GW of wind capacity, but only 25% of it is delivered mainly due to wind fluctuations, i.e. in fact it demands to construct 120 GW of wind capacity. Supposing in average 2 MW rated capacity of a wind turbine, 60,000 wind turbines have to be installed over the next twelve years in the UK. However, it is not everything. When wind does flow, no electricity is produced by all installed wind turbines. In Denmark their ‘wind carpet’, which is the largest array of wind turbines in Europe, generated less than 1% of installed power on 54 days during 2002. In fact, wind generation is so useless, that Denmark has never used any of its wind-generated electricity – because it is too variable. Denmark has merely exported its wind supplies to Norway and Sweden, where they have many hydro power stations to cope with fluctuations. 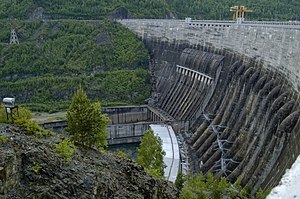 Present pumped storage systems are fully utilised. These storage systems provide with a very small percentage of the whole electricity for just a few hours. Pumped storage systems can´t be built anywhere. In Britain, for example, only very few sites are available. The same kind of arguments can be given for flywheel energy storage, compressed air storage, battery storage and hydrogen storage – for each and every one of these systems is very expensive, highly inefficient and limited in capacity. Besides hydrogen is not an energy source, it should be produced before its usage. Moreover, hydrogen powered vehicles and generators are only about 5% efficient. The hydrogen, is extremely flammable and potentially explosive. For ensuring recharge of hydrogen powered vehicles (and electric vehicles) the capacity of current power plants should be doubled or trebled. That´s why for predictable future the nuclear technology (either fission or fusion) is the only practicable realizable energy source. Even if nuclear power has a bad sound especially due to Chernobyl only nuclear power plants can cover demands on electricity and keep the life level which people in the developed countries are used to having. New technological capabilities will ensure the safety and efficiency of nuclear power plants development and maintenance. Moreover, the nuclear power is non-polluting. As for nuclear safety issues it is necessary to remind that ecological damages and number of people killed within oil and coal extraction industries over past decades are much bigger than in nuclear power plants incidents. But media devote much more attention to the incidents caused by nuclear power and so influence public opinion in this way. Nonetheless, nuclear energy is not renewable. It means that it is only a temporary solution, a temporary stop-gap. But this stop-gap enables providing the world with 1000 years of energy. During this time more convenient source of energy could be found out. I selected this topic because I always wanted to know something about nuclear technologies, nuclear energy and its application in modern equipment such as power plants and submarines. Many people are afraid of Temelín and nuclear power plants as they still brightly remember the explosion in the Russian nuclear power station in Chernobyl and the consequences that have had an impact on east European nations to this day. People all around the world wouldn’t be so afraid of nuclear energy. The fuel for nuclear fission is a special isotope of metal uranium called U-235, which has 235 nucleons in its core. When a neutron hits such an atom of uranium, it splits the atom into two smaller ones. Within this process, two or three neutrons “fly” speedily out of the dissociated nucleus, dissociate other atoms and unleash more neutrons and energy from their cores. Thus the procedure goes on. This is how the chain reaction works. And how does it all work in a nuclear power plant? 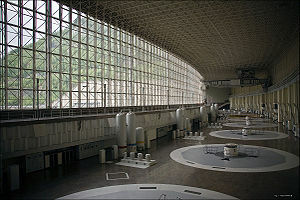 The reactor, wherein the chain reaction runs, is cooled by cold water. The water flows through the pile, vaporizes into steam and then reels the turbine that drives the generator. After that the steam condenses and as water flows back into the reactor’s core. Adjusting rods, which are mostly manufactured out of cadmium or boron, regulate the speed of the nuclear reaction. The greatest advantage is that electric current generated by nuclear reaction is extremely effective. Up to now, there has been no more efficient way discovered. One kilogram of dissociated uranium unleashes the amount of energy equal energy acquired by burning 25 tons of top black coal. Just imagine that! It’s 25,000 times more! Not to mention the devastated landscape and highly polluted air after coal mining. Another advantage, which is perhaps just plain fact, is that there’s still enough uranium to use. As we all know, the resources of both black and brown coal are decreasing and soon, all of the mines will be exhausted. And regrettably, there aren’t many places where you could effectively utilize solar energy, geothermal energy, waterpower or airpower. All the same, the effectiveness of such resources of power is relatively insufficient. So for the time being, the nuclear power plants are the only usable solution. Nor is the fact that nuclear power stations do not pollute air and produce minimum of unwanted spillover products in contradistinction to other power facilities omissible. An average nuclear power plant produces just some 60 kilograms of highly radioactive toxic waste per year. Which is, on the other hand, rather disadvantageous. In fact, that’s a big problem. Approximately 2 per cent of these materials, such as plutonium, are frightfully dangerous substances. They need up to 1000 years to decompose, so that they aren’t radioactive and don’t ruin our health (by the way, if you inhale just one-millionth gram of plutonium, you are taken ill with cancer). The only available and reasonable solution is to store this fall-out in highly secured places. The last important negative is that despite thorough protection against radioactivity from the uranium used in a reactor, the small amount of radiance still gets out from a power plant. But since this radiance represents less than one-hundredth part of the natural sources of radioactivity such as minerals or rocks, this emission is completely imponderable. I myself am for nuclear power plants because they are very efficient and they have almost no effect on the environment. Even though the running of them can be quite dangerous in a way, it’s still the only solution for generating a sufficient amount of electric energy after we have exploited all stocks of coal, petroleum and natural gas. Ensure regular SKYPE conversation conferences on technical topics. Involve in these conferences students from English speaking countries. Involve students from English speaking countries in written discussion carrying out on the blog https://techenglish.wordpress.com/. Complete e-books Computer English and Internet English containing technical texts and exercises for development of communication skills. Come in affiliated programs on the Internet concerning study of technical English. I invite my students to participate in the project, too. Find below another student´s distinctive opinion about importance of English for technical studies. Enjoy it and have comments. Thank you in advance for them. I think that English is well-nigh certainly the most important world language. It has probably happened due to the large area where people speak English. I like English because it is simple, and I find it nice to listen to. For me as a potential future electrical engineer English is very important because in the “world of technicians” English is absolutely everywhere. Internationally used names of computer parts, world’s best web pages, or shortcuts in programming languages, that is all English, or it comes from it. Moreover, in my personal life I need English as well. It is the best language for me to speak abroad, on holidays or in connection with my sport activities – playing young evolving sport – floorball – or refereeing it. Furthermore, I play computer games, which are originally in English. Besides I play some games on the Internet international servers. Thus I have many e-friends not only from the Czech Republic and I need English to communicate with them. So these would be my main personal reasons why to learn English. Maybe I “must” like English, and if this was the only reason why to like English, I would like it. Prof. Ing. Jiří Tůma, DrSc. (Prof.) from the Faculty of electrical engineering of the Czech Technical University in Prague, the Czech Republic (http://fel.cvut.cz/) was asked questions by Galina Vitkova (GVi). GVi: How many foreign languages do you make understood yourself orally and in writing? Prof.: I make myself understood English, Russian and German. In writing and orally as well. GVi: Kolika cizími jazyky se domluvíte ústně a písemně? Prof.: Domluvím se anglicky, rusky a německy. A to písemnou i ústní formou. GVi: How significant are foreign languages in your professional life? GVi: Jaký význam mají cizí jazyky ve Vašem odborném životě? Prof.: Cizí jazyky jsou pro profesní život nezbytnost. Bez komunikování nejde spolupracovat a vedlo by to k izolaci, vůči svým kolegům a přátelům. GVi: What language do you use chiefly for communication with people out of the Czech Republic? Prof.: generally I use English even in the case of the other native foreign language. Most of our partners, whose native language is German, speak English very well. Russian native speakers prove great progress in having a grasp of English just lately. GVi: Jaký jazyk používáte nejčastěji pro komunikaci s lidmi mimo Českou Republiku? Prof.: Nejčastěji používáme anglický jazyk a to i ve vztahu na další mezinárodní jazyk.Většina našich partnerů hovořících mateřskou řečí němčinou, vládne velice dobře anglicky. Také rusky mluvicí partneři vykazují poslední dobou znatelné pokroky v anglickém jazyce. GVi: What is a bigger problem for you – oral or written communication? Prof.: The problem is not the oral or written communication. The written communication need not be so immediate, I can look up the word the most suitable for me. During the oral communication the flow of speaking is smarter and quicker. GVi: Co je pro Vás větší problémem: ústní nebo písemná komunikace? Prof.: Problém není ústní nebo písemná komunikace. Písemná komunikace nemusí být tak bezprostřední, mohu si vyhledat slovíčko, nejlépe mi vyhovující. Při ústní komunikaci je spád hovoru bezprostřednější a rychlejší. GVi: How do you refine your technical English knowledge skills? Prof.: Language knowledge skills need practising and training. I do it while reading professional technical texts, doctoral theses, new publications. GVi: Jak zdokonalujete své dovednosti v technické angličtině? Prof.: Jazykové dovednosti se musí cvičit a trénovat. V odborných textech, doktorských disertačních pracích, nových publikacích. GVi: Do you have a method for drilling and remembering new technical terms that perpetually appear in the field of computer science and the Internet? Prof.: The method to remember new words doesn´t exist. The terms in the field of computer science and the Internet must be memorized in the same way as for other professional fields. New terms are permanently learnt by heart as long as they are remembered. I am afraid the new method does not exit and can´t exit. GVi: Máte nějakou metodu na zapomínání nových technických termínů, které se neustale objevují v oboru výpočetní techniky a Internetu? Prof.: Metoda, jak si zapamatovat nová slovíčka, není. Termíny z oboru výpočetní techniky a internetu musí se zapamatovávat stejně jako z jiného oboru. Nové termíny se učí tak dlouho, dokud nebudou plně zapamatována. Obávám se, že nová metoda není a nemůže být. GVi: What kind of texts in English do you like and prefer to read, are they of common interest (e.g. about travelling or holidays, fictions, newspapers etc.) or technical texts connected with your profession? Prof.: Mostly I read in English professional texts ether printed or on the Internet. Also I am studying theses of our foreign magisterial or doctoral students. I read often original English newspapers. GVi: Jaké texty v angličtině nejraději čtete a jakým textům dáváte přednost, jsou to obecná témata (například, cestování, rekreace, beletrie, noviny apod.) nebo technické texty, spojené s Vaší profesí? Prof.: Nejčastěji čtu v angličtině odborné texty, a to buď v písemné formě, nebo na internetu. Studuji také práce našich zahraničních magisterských, nebo doktorandských studentů. Často čtu originály noviny. GVi: Which issues made perhaps make now the most serious problems that you met or meet within practical usage of English? Prof.: I do not remember any problems I met or meet during practical usage of English. In my case the essence of a problem is on the first place, whereas the form and manner of presentation are on the second. In any case it doesn´t deal with a significant problem. GVi: Jaké byly a případně jsou ty závažnější problémy, s kterými jste se setkal nebo setkáváte v praktickém využívání angličtiny? Prof.: Není mi známo, že bych narazil na nějaké problémy při praktickém využívání angličtiny.V mém případě, je prvotní věcný problém, na druhém místě forma a způsob mluvy. V žádném případě nejde o závažnější problem. GVi: How do you see potential and prospects of modern IT for English studying? Can you imagine some actual use of them? Prof.: I am neither a specialist on IT nor on schooling English or other language. I am, however, confident about IT usage for studying generally (certain problems could appear concerning labs and the like), materials are brought directly to students, so I am confident about IT usage rightness for studying languages too. GVi: Jak se díváte na možnosti a perspektivy využívání moderních IT k výuce angličtiny? Umíte si představit nějaké konkrétní použití v tomto směru? Prof.: Nejsem odborník na IT ani na výuku anglického, nebo jiného jazyka. Jsem však přesvědčen o perspektivách využívání IT pro studium obecně (určitý problém mohou přinášet laboratoře apod. ), materiály se dostávají bezprostředně ke studentům, a proto jsem přesvědčen o účelnosti IT i pro výuku jazyků. GVi: How do you feel about English knowledge by students of the Faculty of electrical engineering in the CTU? Prof.: Last year I had been coming in contact with foreign students and doctorands. I don´t have a complete grasp about native students, whose language skills was of a lower level. Sometimes, the language exams were the last ones, which students must have done. So, after finishing the school some of them go abroad on practice just to improve their language knowledge. GVi: Jak hodnotíte znalost angličtiny studenty FEL ČVUT? Prof.: V posledním roce přicházím do styku se studenty zahraničního studia a doktorandy. Nemám úplný přehled o domácích studentech, úroveň znalosti jazyků byla slabší. Někdy to byly poslední zkoušky, které student musel dělat. Někteří odjíždějí po skončení školy na zahraniční praxi, právě pro doplnění jazykových znalostí. GVi: What will students of the Faculty of electrical engineering go in for studying languages? Prof.: Opinions can differ. I consider an ability to comprehend each other when speaking a basic means of communication. Professional texts are of the second significance, it is possible to translate them and participants of the debate will always understand each other. In any case it needs endeavour and willingness. It does not thrive without the endeavour. GVi: Čemu by se nejvíce studenti FEL měli věnovat v jazykové výuce? Prof.: Názory se mohou různit. Schopnost se domluvit bych viděl jako zásadní prostředek komunikace. Odborné texty přicházejí na pořad později, je možno je překládat a vždy si budou diskutující rozumět. V každém případě to chce snahu a vůli. Bez snahy to nejde. GVi: Thank you very much for answers, for your recommendations. To your success in education of electrical engineers. GVi: Děkuji velice za Vaši odpovědí a doporučení. Hodně úspěchů v profesní výchově elektroinženýrů.